Submitted by Quest-News-Serv... on Tue, 07/14/2015 - 19:27. Scientists have outlined their alarmingly unhelpful tips on how to survive the earthquake that will hit the Pacific Northwest. The killer quake along Cascadia, a fault line which runs from Cape Mendocino, California, to Vancouver Island, Canada, is 72 years overdue, according to peer-reviewed studies. 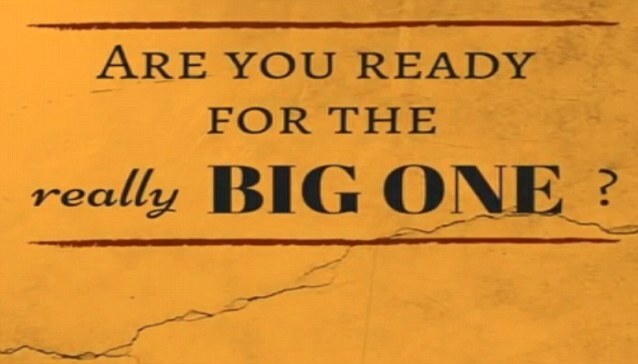 The 'Big One' will hit when Juan de Fuca, a 700-mile chunk of the Pacific Ocean, slides under Canada and America, causing the entire coastal region to sink at least six feet. When - not if - it arrives, it is unlikely the people of coastal Oregon, Washington and California will be able to escape. But if they want to try, there are a few tips they should keep in mind. WHAT WILL CAUSE KILLER QUAKE? The Cascadia Subduction Zone (CSZ) 'megathrust' fault is a 1,000km-long line that stretches from Northern Vancouver Island to Cape Mendocino California. It separates the Juan de Fuca, a 700-mile chunk in the Pacific Ocean, and North America plates. For more than 300 years, the two plates have been pushing against one another. Eventually, the Juan de Fuca will be pushed underneath the North America plate, causing the region to sink at least six feet. Run, don't drive, to higher ground, says Kevin Cupples, the city planner for the town of Seaside, Oregon, in an interview with the New Yorker. The force of the quake will cause liquefaction, when solid ground acts like liquid, across vast swathes of the porous region. In the areas that aren't 'liquefied', the highways will likely be crumpled by landslides, with 30,000 avalanches set to hit Seattle alone. Citizens will have a 20-minute interval to climb to the highest altitude possible before the full force of the tsunami hits, scientists predict. Their alert will be when dogs start barking. The first sign the quake is coming will be a set of compressional waves, only audible by dogs. Then there will be the quake, then 20 minutes later, the tsunami. Geographers estimate that many could survive just by walking - however, they need to be going at least 3.5mph. If everyone ups their average speed from 2.5mph to 3.5mph, the death toll drops to 15,970. About 70 per cent of them would be in Washington, nearly 30 per cent in Oregon and only 4 per cent in California. And there is no point being a hero. 'When that tsunami is coming, you run,' Jay Wilson, the chair of the Oregon Seismic Safety Policy Advisory Commission, tells the New Yorker. The only other safety measure is to relocate away from the Pacific north west. 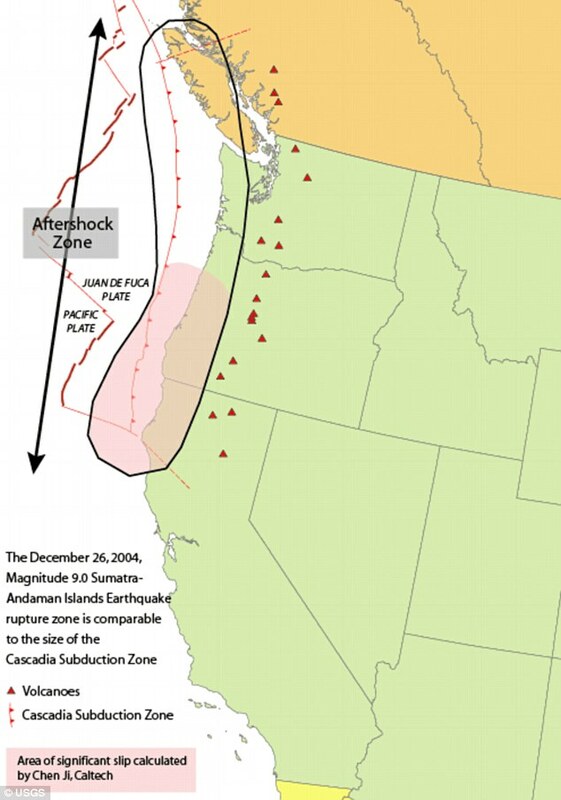 The Cascadia earthquake fault zone lies underwater between 40 and 80 miles offshore of the Pacific Northwest coastline. 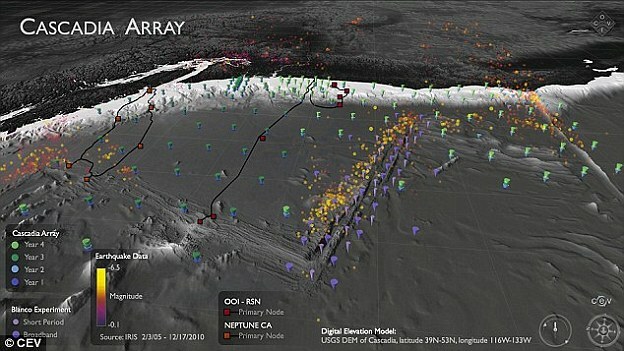 Earthquake scientists have listening posts along the coast from Vancouver Island to Northern California, and have been using ships to drop off and later retrieve ocean bottom seismographs. These record for up to a year right on top of the fault zone. However, they have detected few signs of the grinding and slipping they expected. The Cascadia Initiative (CI) is an onshore/offshore seismic and geodetic experiment that takes advantage of an Amphibious Array to study questions ranging from megathrust earthquakes to volcanic arc structure to the formation, deformation and hydration of the Juan De Fuca and Gorda plates. It is 'a puzzle,' according to University of Oregon geophysics professor Doug Toomey. Two teams have been examining the area. A joint Japanese-Canadian team dropped instruments offshore of Vancouver Island, while Toomey's team is in its fourth year of deployments. 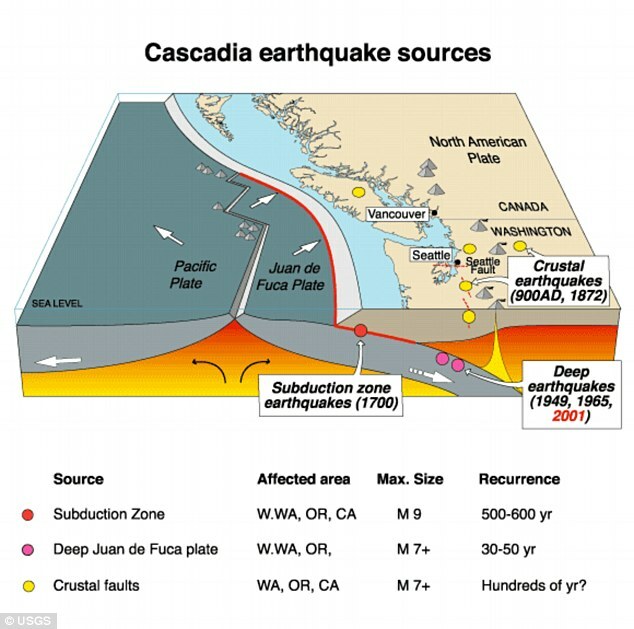 Named the Cascadia Initiative, it is rotating among subduction zone segments offshore of Washington, Oregon and Northern California. That is where the advice ends. Experts insist they have been lobbying city planners to take more affirmative action, such as ban construction on the targeted coastal areas. Some parts of Oregon have made it illegal to build schools in the red zone, but not hotels or retirement homes. Ocasta Elementary School south of Westport, Washington, is building a new gymnasium tall enough for the roof to serve as a tsunami evacuation structure. Pacific County is seeking a grant to build a large berm next to Long Beach Elementary School for the same purpose. In areas such as - with high proportions of elderly and disabled citizens - Ocean Shores, Long Beach and Pacific County, Washington, and Seaside, Oregon - vertical evacuation structures might be considered. Meanwhile, local groups are constructing post-tsunami plans, such as how to forage for food, what should be in a 'survival kit', and how to 'anchor' a home for $5,000. 'In a six-month scenario,' writes the Portland Monthly, 'five people would need at least 900 gallons of water. Thousand-gallon storage tanks can be had for $500. Other tips include stocking a hand-crank radio, a can opener, protective goggles and work gloves, and plenty of socks.